Dr. Pedersen is a highly respected Hindu scholar who is currently teaching a course on The Hindu World at St. Joseph's College as this year's Khatib Chair in Comparative Religion. St. Joseph’s College (SJC) is pleased to announce The Dr. Reza Khatib and Georgianna Clifford Khatib Chair in Comparative Religion Eighth Annual Lecture featuring Kusumita P. Pedersen, Ph.D., chair of the Department of Religion at St. Francis College. 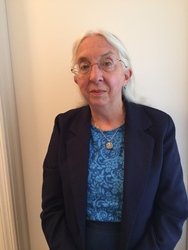 Her lecture, “Hinduism and the Universality in Religion” will be presented on Tuesday, April 5 at 7 p.m. in the McGann Conference Center at SJC Long Island located in Patchogue, New York. Dr. Pedersen has been involved with the international interfaith movement for more than 25 years. Previously, she was executive director of the Project on Religion and Human Rights, joint secretary for religious affairs of the Global Forum of Spiritual and Parliamentary Leaders on Human Survival, and executive director of the Temple of Understanding. Currently, Dr. Pedersen co-chairs the Interfaith Center of New York and is a member of the Board of Trustees of the Council for a Parliament of the World’s Religions. Dr. Pedersen wrote for The World’s Religions After September 11 (Praeger, 2008), which highlights the modern changes in the relationships between faiths. Founded by Dr. Reza Khatib and Mrs. Georgianna Clifford Khatib ’52, the Chair’s purpose is to promote interfaith dialogue, with the study of Islam being an integral part of the initiative. Each spring, through the generosity of Dr. and Mrs. Khatib, SJC hosts a noted scholar who lectures, leads faculty discussions and teaches a course to students from both campuses. For more information about The Dr. Reza and Georgianna Clifford Khatib Chair in Comparative Religion, call 631.687.2663 or visit sjcny.edu.